Linden Public, housed in the historic Broadlind building in Downtown, has closed. Photo by Brian Addison. 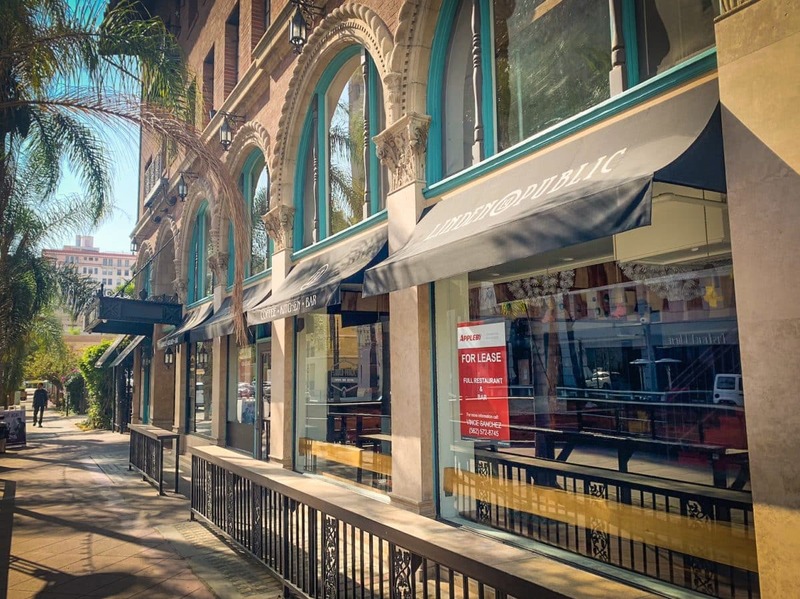 It’s been a rough month for restaurants in Long Beach: Linden Public, the brainchild of owner Hend Elarabi, has closed up shop, becoming the fourth restaurant this month to shutter. Elarabi, who opened Linden Public in August of 2016 is no stranger to the Downtown scene: she previously opened The Greenhouse coffee shop in the space where Linden Public operated, becoming the first coffee shop in the city to truly embrace specialty coffee (and one of the first places you could score Rose Park coffee outside of its delivery-by-bike service). During Greenhouse’s tenure, she opened the popular ASHA right next door, where Thai District now sits, a restaurant that harkened to her Moroccan upbringing. Elarabi was born in Morocco before moving with her family to Studio City in 1990 and then directly to Long Beach. Working for Open Sesame in Belmont Shore, the food inspired her to return to her Moroccan roots and eventually open ASHA. With Linden Public she tried to keep hints of those Northern African and Middle Eastern roots alive while introducing items that focus heavily on veggies, local ingredients, and items that can pass for lunch or dinner. A chicken tawook wrap sat next to a smoked salmon panini while a lamb burger with feta sat next to a falafel burger. Despite its best attempts at recreating the crowds that ASHA drew, Linden Public faced continual issues, with multiple closures labeled as “remodeling” beginning this year. In fact, a remodeling notice still hangs in the window below the space’s new leasing signs. And that is unfortunate given its expansive parklet patio, one of the most accommodating outdoor dining spaces in Downtown. It remains unclear as to the specific reasoning behind the closure; Elarabi has yet to return comment for this story. This mark’s the city’s fourth restaurant closure: Russo’s is closing up shop after 30 years in Naples due to landlord disagreements; Seoulmate on 7th is shuttering its windows next month; and the Spot Cafe in Belmont Shore closed up after receiving a 40 percent rent hike that the small cafe was unable to accommodate. This year overall, it marks another grave in the restaurant scene: Acapulco Inn, Tavern on 2, Brix’s, and one of the oldest Jack in the Boxes in the city all closed in the Shore while E.J. Malloy’s closed its flagship location in Belmont Heights.